The latest NHS statistics on Delayed Transfer of Care show a dip in national performance by 1.4% between December 2017 and January 2018. Overall, delays have fallen by more than 26% since last February. Next month’s data release will therefore be an important test of whether this was just a blip or whether the gains of the past months have not been sustained. On the one hand, the intense pressure from central government on the NHS and on local authorities, and the additional money through the Improved Better Care Fund (iBCF) to improve DTOC rates, has supported this change. There continue to be unexplained and indefensible variations across local areas, but overall, congratulations are in order. It has been a rocky ride, but the one really important thing we should hold onto as we move forwards is that one part of the system (social care) can have a significant impact on another (health), and that both sides have worked together to solve a problem. So what’s next? My view is that we must now must turn our attention to the framing of the problem itself. The focus on one performance indicator within a complex system has arguably made it difficult to see the wood for the trees. Framing the problem simply as ‘DTOC’ has meant that we have lost sight of the patient as an individual, and of our desire to keep people independent, well and supported in their own homes for as long as possible. A good illustration of the bigger picture is emergency admissions, where there were some 5,731 more cases in January than in December. And to take a longer view, there were 33,624 or 6.8% more emergency admissions than in January 2017. When you consider the pressure that these extra admissions place on an already stretched system, the slight increase in DTOC delays were not a surprise – and in fact could have been a lot worse. If we imagine a scenario where emergency admissions had risen to current levels, but where there had not been an improvement in DTOC days over the last year, then we would have needed another 2000 hospital beds. In other words, the number of people admitted to hospital is actually a bigger issue. How many of these admissions could either have been avoided in the first place, or addressed in a different way and therefore resulted in better outcomes? A recent report from the National Audit Office suggested that the answer is one in four. This is where we should be focusing our attention. 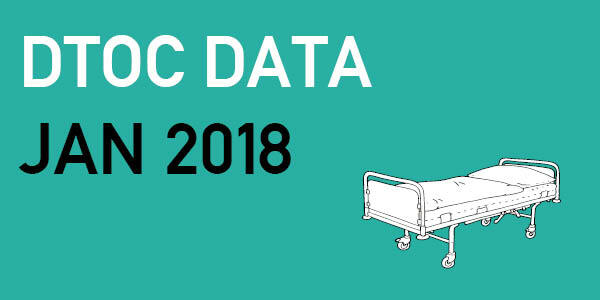 To see how your local authority is performing on DTOC, or to look at DTOC days and emergency admissions in your local health Trust, download the file below.